Here is the 2018 Make and Take schedule. at our 2018 annual Bead Bazaar! Please check in at the front registration desk at the Scottish Rite Event Center at least ten minutes before the start of class. Our front desk volunteers will point you in the direction of the Make and Take classes. You may also sign up in person at the Bead Bazaar, but we can’t guarantee your spot unless you sign up ahead of time. 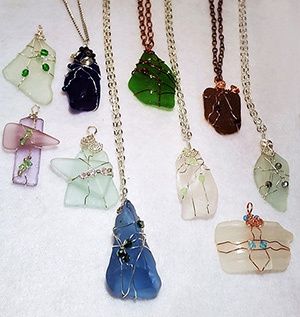 Description: In this class we will use a technique to wire wrap an uneven piece of beach glass, turning it into a lasting treasure, a pendant you can wear home, by using the wire to both decorate and capture the sea glass, and then further embellishing it with crystals and beads, if you choose. Even the chain to wear it home is provided! Description: Easy and quick way to make a cute sparkly bracelet using leather and bent metal tubing. Add in some crystals and wow! 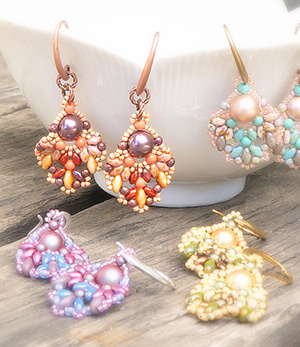 Description: The Spanish Veil Earring project uses seed beads and two-holed beads to create a modern Bohemian look. This is a two hour workshop. Description: The sand dollar is that unexpected treasure found on the shore – the perfect sized talisman to fit in the palm of your hand and live in your pocket – a reminder of a moment in time and place when you were at ease and focused on the far horizon. 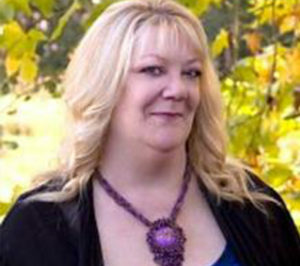 A wonderful tangible little inspiration to wear over your heart. 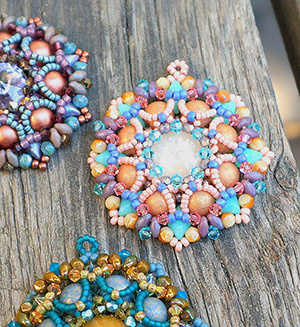 In this workshop, you’ll be bead weaving with seed beads, crystals and two-holed beads while learning to create a beaded bezel around a sparkling crystal rivoli. 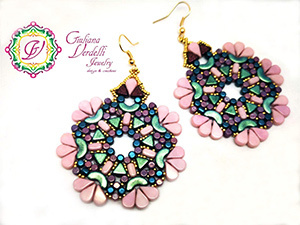 Description: These beautiful mosaic style earrings will make you feel like you are a Queen when you put them on. The Queen Earrings are a special design from Giuliana Verdelli Jewelry of Italy for the San Diego Bead Society Bead Bazaar. They blend together to create an enchanting design of colors and shapes like a beautiful kaliedescope. 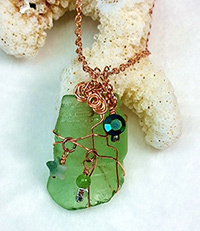 This design uses Kheops, Arcos, and Minos beads designed by Puca. 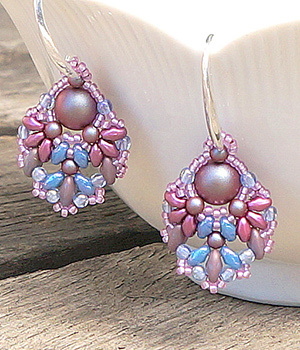 All the beads used are made specifically by Les Perles par Puca® of France. Description: Julia’s Bracelet was designed for the Bead BAzaar by PUCA. 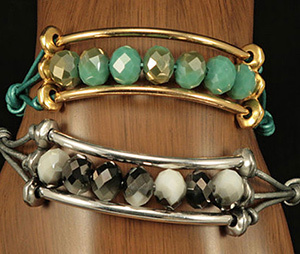 It is a fun and casual bracelet that is easy to make and can wear with any outfit. This is a beautiful bracelet made with Arcos and Minos beads by Puca. 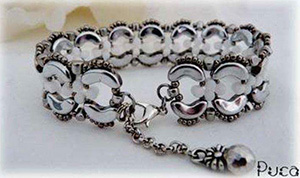 These beads are seen in the latest bead magazines. You will get to use some new beads made specifically by Les Perles par Puca® of France. 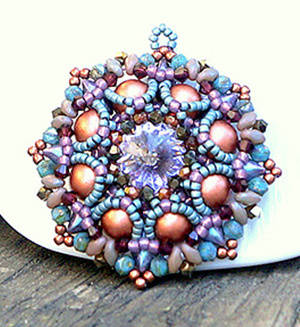 Description: Camilla’s Pendant is a great new pendant design by PUCA for the Bead Bazaar. It has a marbled new cabochon adorned with seed beads, Arcos and Super-Kheops by Puca. 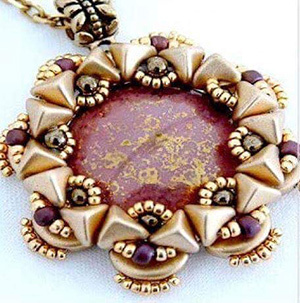 This pendant is rich in style and beautiful to look at. 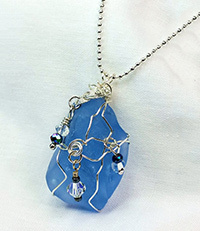 With a little time this beautiful pendant can be worn that night. You will get to use some new beads made specifically by Les Perles par Puca® of France. 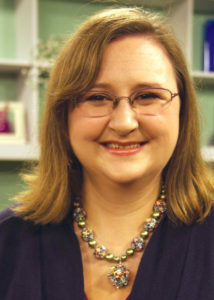 Please contact Amy Butzen at amyjb627@gmail.com if you are having any difficulty signing up for any classes.